The latest ISIS report by mainstream media is in. As has been the case since 2014's launching of the ISIS show, CNN once again has taken the lead in being the mouthpiece of Intelligence to spread lies and deceit to the American people to set them up for a future terror event. Now we're told ISIS is supposedly here in the United States. The way that FBI and other Intelligence agencies know this is because they overheard some "chatter" somewhere. Everything else about the new ISIS threat revelation is a secret that you apparently do not need to know because the government agencies are "not" willing to be more specific about anything at this time. Also, someone whose identity is NOT known has asked the Intelligence agencies and the reporters like CNN's Evan Perez to "NOT" reveal too much about this ISIS threat. The report assumes that less information is better and safer. The government is apparently the only one that needs to know what is happening. The citizens will find out what is happening only when government decides to tell them. All else is a secret and information is given to the sheep who watch CNN only on a need-to-know basis. This secretive condition is apparently acceptable, assumed and not to be questioned either. This super secretive scripted mainstream media reporting devoid of truth, evidence, critical thinking, transparency and sound reasoning is now the blueprint for maintaining the facade of the false "terrorism" narrative going. Many truth seekers would probably agree it is painful to watch these scripted reports. The agony a sound minded truth seeker must endure watching such contrived reports can be understandably overwhelming. 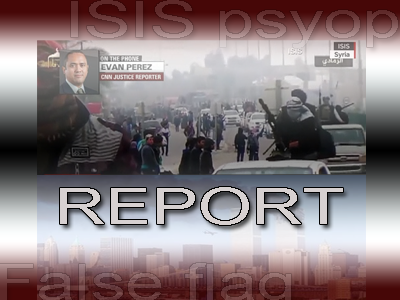 CNN - Coming ISIS attack "Not aviation related"
This latest CNN ISIS psyop report eerily suggests the next 9/11-size attack supposedly being planned by ISIS is "not necessarily aviation related". The CNN reporter is reporting as if he's been told what is going to happen. Now how could Intelligence be so sure about what ISIS is thinking?? Sadly, as long as Americans are still living in the mainstream media matrix of lies, as long as Americans refuse to acknowledge that mainstream media is factually run by the CIA, they will never get past these types of surreal, fictional propaganda reports intended only to set you up for the next false flag. The next false flag will then be used to take away more of your freedoms, justify more wars and thus more money for the Military Industrial Complex and move the Western cabal closer to fulfilling its PNAC global takeover plans. Realize now that every phony ISIS report spun by mainstream media is intended to bring us one step closer to 'ISIS attacks America' day. Why else would the CIA bring ISIS stories to our doorstep? This is the same ISIS that refuses to attack supposed arch enemy Israel. The same ISIS who has defied all rules of humanity, has outsmarted every government on earth, has out-done every Intelligence agency, out-performed every military unit on earth who has dared to challenge it. Simply put, according to Western mainstream media, and as proven once again by the latest ISIS psyop report, ISIS is the greatest, most indestructible force humanity has ever produced. ISIS is multiple levels of brilliance all stacked in one. According to the CIA's mainstream media, ISIS has humiliated the U.S. and all of its allies, overpowering nation after nation using U.S.-made weapons, attacking all of U.S.'s foreign enemies while helping push the police state here in the U.S. by simply trying to come here. The world has been bowing to the new ISIS god who magically seems indestructible and able to endlessly supply itself with food, water, ammo and other supplies. So, while Americans are spied on with every single thing they do; while millions of Americans are tracked overseas and everywhere they go; ISIS on the other hand enjoys a freedom no other humans on earth enjoy. ISIS pays no taxes, works for no one, gets free guns and pays no bills. ISIS avoids all Intelligence and surveillance and is even able to invisibly and freely travel to the U.S. from all the way in the Middle East with their U.S.-made weapons (apparently) and openly plot to destroy America all the while winning multiple wars on multiple fronts and recruiting globally on the Internet without being traced by anyone except CNN reporters who get their secret information from "Intelligence sources", who happen to know everything that ISIS might do while at the same time are unable to produce any arrests. Tired of the ISIS show yet? Feel insulted intellectually? You should. As the ISIS show grows older and older everyone should be wondering what the true purpose of the latest report was. Everyone should be putting aside their differences and sharing with others what they know about the looming danger brewing behind the ISIS show. Look back to history and learn the government's blueprint for enslavement. Now is the time to become familiar with how they need a bogeymonster to maintain their power. And that is what this latest CNN report is about. Without ISIS/Al Qaeda and the ongoing phony war on terror the politicians will lose their jobs, wars will end, American foreign policy would be destroyed, the new world order plans halted. The U.S. and its NATO allies all need to maintain the war on terror; and as long as that is true, reports like these will continue. As truth seekers we are tasked with analyzing these packaged lies intended to deceive the masses and do the best we can to expose these plans well ahead of time. So as we are forcefully march toward the next 9/11, let us keep these reports in mind and remember that these reports play a huge role in the lead-up to the next false flag. Hopefully if and when the time comes knowledge will trigger action in enough people and human consciousness will experience a shift in paradigm. One that will pave the road for a conscious existence that does not involve government at all. Finally, I want to emphasize the importance of understanding the difference between information gathering (as this is here) versus understanding and wisdom or knowledge synthesis and action. In terms of action we need to keep finding ways to make government obsolete, and exposing their lies is a big part of that. We need to become the solution; and in order to understand the solution one must truly understand what the problem is. I believe that being the change and implementing solutions is a stage one arrives at once you understand the situation we are in. We must align ourselves with truth regardless of what that truth may be. Truth involves understanding the evils that surround us (the ISIS psyop). Once we understand the events around us we are then able to move passionately with more purpose, and that purpose and passion thus will attract others to the truth and the solutions.